Considerable experience in cardio-vascular research employing different techniques across several laboratories has furnished Dr Fatemeh Moheimani with the skills needed to excel in her most recent area of focus in respiratory disease research, in particular, the airway epithelial cells in asthma. Fatemeh is looking at what is happening at tissue and molecular level inside the lungs of asthma sufferers. “Since the air we breathe is common between people who suffer from asthma and those who don’t, there should be underlying mechanisms at tissue and molecular level, responsible for asthma development,” Fatemeh explains. 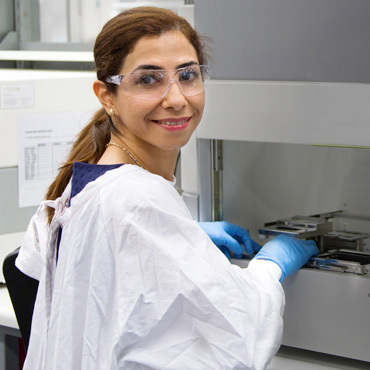 Coming from RMIT in 2013 to establish Professor Darryl Knight’s Airway Cell Biology Laboratory and lead asthma research program in this laboratory at the Hunter Medical Research Institute (HMRI), Fatemeh has quickly proven she is more than capable of rising to the challenge of mastering a new area of focus whilst running a world-class research facility. The epithelium is the thin tissue lining the outer layer of the airway surface and is the first protective barrier between inhaled particles, for example allergens and viruses, and the internal environment of the lung. Some cells produce mucus which lubricates the surface for protection against scratches from foreign particles. Other cells develop cilia, tiny hairs that aid in the removal of the foreign particles through a constant pulsing. The balance between these cell populations is essential for normal function of the epithelium in the lung. Unfortunately, this balance isn’t always achieved in asthmatics. In asthmatics, cells predominantly stay in the stem cell or basal cell mode. These abnormalities in asthmatic epithelium prevent normal regeneration after epithelial wounding, resulting in a cycle of inflammatory and detrimental effects. “The focus of the lab is trying to understand further what is happening during the whole process of epithelial cell proliferation and differentiation, so we can identify why asthmatic epithelium behave in a divergent manner,” Fatemeh clarifies. These mechanisms are being investigated with a focus on identifying the precise roles of epigenetic factors which is defined as how environmental factors can influence gene expression. “I’m particularly looking at microRNAs, they are biological regulatory factors and they are silencing RNA and post-transcriptionally regulating gene expression,” Fatemeh says. Proteins are also an important part of the equation in the structure of cells and connect the epithelial cells to each other and their underlying structure. Each microRNA targets different proteins. Fatemeh’s journey to her current position has been long and impressive. After completing a doctorate degree in pharmacy in Iran (Pharm-D), she migrated to Australia to follow her passion for research. Moving to the University of Adelaide in 2003, after working briefly for the University of Newcastle, she completed a Masters of Medical Science by research, investigating the effect of a novel polyunsaturated fatty acid on the development of atherosclerosis in apoE deficient mice. A short stint at the Flinders Medical Centre followed before Fatemeh was offered an APA scholarship from the University of Sydney to undertake a PhD. “My PhD was about cardiovascular disease in people with diabetes. I looked at the molecular mechanism linking diabetes with atherosclerosis,” she affirms. Joining RMIT’s Thrombosis and Vascular Diseases Laboratory as a postdoctoral researcher in 2010, Fatemeh focused on the role of different regulatory mechanisms of platelets during thrombosis formation. Here, she also gained invaluable experience in co-supervising and mentoring postgraduate students. Fatemeh returned to Newcastle in 2013 as a postdoctoral fellow to work with Professor Darryl Knight, a preeminent expert on airway epithelium and respiratory diseases. Clearly fascinated by the mechanisms she is studying, Fatemeh animatedly describes a protocol developed by Professor Knight and other scientists to create a mimic in vitro epithelium for study. “We use an air liquid interface technique (ALI) here in the lab where we can grow the primary epithelial cells in a pseudostratified structure,” she divulges. Much lauded and with a history of varied research behind her, one is left to wonder what body part Fatemeh will become expert in next. “At the moment I am focusing on understanding the underlying mechanisms responsible for respiratory diseases, particularly at airway epithelium level,” she states. Ever humble, Fatemeh laughs away any suggestion that her dedication and achievements are awe-inspiring. “I am telling you, the whole way through I have always worked with passionate and fabulous people,” Fatemeh attests. One of her roles in the lab is supervising/mentoring of students and junior staff. Experience has afforded Fatemeh a philosophical approach to her research that she shares with her mentees. “It is good to have a goal and then find your way towards it,” she observes. “It is not easy, and it is not a one person job. But the people, the equipment and the technology at HMRI are not like anywhere else, it is remarkable,” she asserts solemnly. Fatemeh graduated from Faculty of Pharmacy, Shiraz, Iran with the Doctorate degree in Pharmacy (Pharm-D). She then moved to Australia to pursue her research career. Fatemeh completed her Master of Medical Science (by research: the effect of a novel polyunsaturated fatty acid on development of atherosclerosis in apoE deficient mice) at University of Adelaide in 2005 and her PhD (molecular mechanisms linking diabetes with atherosclerosis) at University of Sydney in 2009. She was offered various scholarships, travel grants and postgraduate grants, e.g. GlaxoSmithKline postgraduate grant (2007-2008: $25,000) during her postgraduate trainings. She also worked as a researcher and taught in various Medical Institutes and Universities. Fatemeh was offered her postdoctoral research fellow at RMIT University in 2010 where she was investigating molecular mechanisms that regulate platelet thrombus formation. During her position at RMIT, Fatemeh co-supervised several Masters and PhD students, acted as postdoctoral representative in school of medical sciences, was successful in obtaining several travel grants and attended prestigious national and international conferences such as Australian Vascular Biology Society (AVBS) meeting (2012), the Gordon Research Conference-Haemostasis, New Hampshire, USA (2012) and the International Society on Thrombosis and Haemostasis, Kyoto, Japan (2011). Fatemeh was then offered her postdoctoral fellow position in Respiratory Cell and Molecular Biology area at School of Biomedical Sciences and Pharmacy, University of Newcastle, in 2013, under the supervision of Prof Knight. She has established Prof Knight’s laboratory and collaborated closely with expertise in the field, including Prof Peter Wark and Prof Philip Hansbro to investigate the importance of tissue and cell specific mechanisms that contribute to the respiratory diseases, particularly asthma. Fatemeh is addressing how the structure and function of epithelial cells contribute to asthma. Fatemeh is a research scientist with background in Biochemistry/Pharmacy and extensive medical research experience in cardiovascular field. The outcomes of her research have revealed essential molecular mechanisms linking diabetes with atherosclerosis. Fatemeh has expanded her research expertise to the respiratory field since 2013. She is particularly interested in asthma and investigating the importance of tissue and cell specific mechanisms that contribute to the disease. Fatemeh is addressing how the structure and function of epithelial cells contribute to asthma. Fatemeh’s has acted as co-supervisor of Masters and PhD students. She also acted as academic supervisor of 8 undergraduate students of professional practice in Discipline of Laboratory Medicine, RMIT University with 100% and 78% good teaching score in 2013. In addition, she has teaching experience as practical tutor in subjects of ‘Traditional Chinese medicine’, ‘Medical science 1’, ‘Medical science 2’, and ‘Essentials of Pathophysiology’ in UTS from 2006 to 2008 as well as teaching in Microbial control of medicines lab and Industrial pharmacy lab in Faculty of Pharmacy, Shiraz, Iran from 2001 to 2002. © 2017 Dysregulated induction of goblet cell differentiation results in excessive production and retention of mucus and is a common feature of several chronic airways diseases. To date, therapeutic strategies to reduce mucus accumulation have focused primarily on altering the properties of the mucus itself, or have aimed to limit the production of mucus-stimulating cytokines. Here we review the current knowledge of key molecular pathways that are dysregulated during persistent goblet cell differentiation and highlights both pre-existing and novel therapeutic strategies to combat this pathology. Chronic obstructive pulmonary disease (COPD) is a serious lung disease that progressively worsens lung function. Those affected are highly susceptible to influenza virus infections that result in exacerbations with exaggerated symptoms with increased mortality. The mechanisms underpinning this increased susceptibility to infection in COPD are unclear. In this study, we show that primary bronchial epithelial cells (pBECs) from subjects with COPD have impaired induction of type I IFN (IFN-ß) and lead to heightened viral replication after influenza viral infection. COPD pBECs have reduced protein levels of protein kinase (PK) R and decreased formation of PKR-mediated antiviral stress granules, which are critical in initiating type I IFNinductions. In addition, reduced protein expression of p300 resulted in decreased activation of IFN regulatory factor 3 and subsequent formation of IFN-ß enhanceosome in COPD pBECs. The decreased p300 induction was the result of enhanced levels of microRNA (miR)-132. Ectopic expression of PKR or miR-132 antagomiR alone failed to restore IFN-ß induction, whereas cotreatment increased antiviral stress granule formation, induction of p300, and IFN-ß in COPD pBECs. This study reveals that decreased induction of both PKR and p300 proteins contribute to impaired induction of IFN-ß in COPD pBECs upon influenza infection. © 2015 Sercombe, Veerati, Moheimani, Wu, Sood and Hua. The application of liposomes to assist drug delivery has already had a major impact on many biomedical areas. They have been shown to be beneficial for stabilizing therapeutic compounds, overcoming obstacles to cellular and tissue uptake, and improving biodistribution of compounds to target sites in vivo. This enables effective delivery of encapsulated compounds to target sites while minimizing systemic toxicity. Liposomes present as an attractive delivery system due to their flexible physicochemical and biophysical properties, which allow easy manipulation to address different delivery considerations. Despite considerable research in the last 50 years and the plethora of positive results in preclinical studies, the clinical translation of liposome assisted drug delivery platforms has progressed incrementally. In this review, we will discuss the advances in liposome assisted drug delivery, biological challenges that still remain, and current clinical and experimental use of liposomes for biomedical applications. The translational obstacles of liposomal technology will also be presented. © 2015 Elsevier Ltd. The epithelium of asthmatics is characterized by reduced expression of E-cadherin and increased expression of the basal cell markers ck-5 and p63 that is indicative of a relatively undifferentiated repairing epithelium. This phenotype correlates with increased proliferation, compromised wound healing and an enhanced capacity to undergo epithelial-mesenchymal transition (EMT). The transcription factor ß-catenin plays a vital role in epithelial cell differentiation and regeneration, depending on the co-factor recruited. Transcriptional programs driven by the ß-catenin/CBP axis are critical for maintaining an undifferentiated and proliferative state, whereas the ß-catenin/p300 axis is associated with cell differentiation. We hypothesized that disrupting the ß-catenin/CBP signaling axis would promote epithelial differentiation and inhibit EMT. We treated monolayer cultures of human airway epithelial cells with TGFß1 in the presence or absence of the selective small molecule ICG-001 to inhibit ß-catenin/CBP signaling. We used western blots to assess expression of an EMT signature, CBP, p300, ß-catenin, fibronectin and ITGß1 and scratch wound assays to assess epithelial cell migration. Snai-1 and -2 expressions were determined using q-PCR. Exposure to TGFß1 induced EMT, characterized by reduced E-cadherin expression with increased expression of a-smooth muscle actin and EDA-fibronectin. Either co-treatment or therapeutic administration of ICG-001 completely inhibited TGFß1-induced EMT. ICG-001 also reduced the expression of ck-5 and -19 independent of TGFß1. Exposure to ICG-001 significantly inhibited epithelial cell proliferation and migration, coincident with a down regulation of ITGß1 and fibronectin expression. These data support our hypothesis that modulating the ß-catenin/CBP signaling axis plays a key role in epithelial plasticity and function.